Some of you have read (in the "E-bay alerts" section of this forum) about the Schubert Edisonic phonograph (serial #3398) that was parted out by a dealer in Pennsylvania in the spring of 2014. This development prompted me to start an inventory of the surviving Edisonic phonographs, which by now probably only number in the hundreds. Edisonic owners are urged to relay as much information about their machines as they feel comfortable sharing. The serial number is highly preferred as this is the only element that definitely identifies a machine. It would also be useful to list Edisonics that we see are currently for sale (contact the seller for the serial number if not provided) so that we can develop at least a partial tracking record for them. In addition, lets post information on machines that were once known to belong to fellow collectors but which have since disappeared (oftentimes following the death of the owners). Also, if you previously owned an Edisonic and have sold it to a dealer, let us know the serial number, if you can. Finally, we need to preserve information on machines as we witness them being destroyed/parted out by dealers. In short, my ultimate goal is to account for ALL the Edisonics--whether living inside homes, hibernating in storage, passing through the market, missing, or destroyed. Obviously we will not reach that end, but a thorough effort will still leave a worthy result. Based on the first month's data collected on this thread (as of May 23, 2014), I will offer a projection about Edisonic production totals. If the serial numbers for both Edisonics began at 1000, and allowing for the possibility that not all serial numbers were used, one can still say that there might have been around 1400-1500 Beethovens made (as of 5/23/2014 we know of serial numbers ranging from 1121 to 2641) and around 4400-4500 Schuberts made (as of 5/23/2014 we know of serial numbers ranging from 1150 to 5678). NOTE: I WILL MAINTAIN AT THE CURRENT/LIVE END OF THIS THREAD AN UPDATED INDEX TO THE POSTINGS ABOUT PARTICULAR EDISONICS THAT ARE BEING MADE ON THIS THREAD. The index will link the postings with the machines’ serial numbers. For the machines for which no serial number is currently known, I will link the postings using a “non-serial number designation” system of my own creation. "You must serve music, because music is so enormous and can envelop you into such a state of perpetual anxiety and torture--but it is our first and main duty"
-- Maria Callas, 1968 interview. Last edited by pughphonos on Sun May 18, 2014 8:29 pm, edited 118 times in total. I have two Schuberts. They both play great, but one is amputated. Both have nice grilles with original grille cloth. Cabinet condition when purchased: B+ level. Upgrades made by present owner: came with standard reproducer. Added gold Edisonic reproducer. Single barrel spring. From whom purchased (general description): antique dealer in Virginia off Ebay. Cabinet condition when purchased: A-; but legs were amputated. Found that out after I received it. Pics did not show legs. Have legs from parts machine, but still missing long stretcher. Upgrades made by present owner: none, has single barrel spring. I have Schubert 4752 and Beethoven 1898. I bought one at auction and the other from CL after being alerted by our good friend Moo. Last edited by pughphonos on Tue Apr 22, 2014 3:41 am, edited 1 time in total. I am copying the following information from the "Online Edison Phonograph Discussion Board," on which a gentleman named Bill Floyd (whose tag was "Maroongem" and who lived in Vermont) posted in February 2011 that he had just purchased a Schubert Edisonic, serial number 3618. Bill died in the spring of 2013 and I don't know what has become of his phonographs. When he purchased the Edisonic he posted the following statement on the Edison Board: "This past weekend, I had the good fortune to obtain an Edison Schubert locally, that was on Craigslist. The drive wasn't too bad, only an hr. from me and the storm that was predicted that morning fizzled out. The machine originally belonged to her mother-in-law and was later inherited by her now deceased husband." I now see that our forum did report on Bill's death. His full name was William "Bill" J. Floyd III. He was 57, of Nashua, NH, and died Sunday, May 12, 2013 at Community Hospice House in Merrimac, NH. Last edited by pughphonos on Wed Apr 30, 2014 1:20 am, edited 4 times in total. "Christie's auction, 17 December 1998"
Sold: Christie's auction, South Kensington, London, UK, for $963.00 US. Note: On April 29, 2014 I received an e-mail from Paul Collenette (former Director of the City of London Phonograph and Gramophone Society, Ltd.) which discussed Edisonics in the United Kingdom (UK). He has been active in the antique phonograph community in the UK for some time and therefore his testimony carries great weight. He wrote: "I remember the one at Christie’s in 1998 – there was a rough one at SAS Auctions, Newbury, Berkshire, 2 or 3 years ago. They must certainly be rare in the UK – I don’t know of anyone who has one." Last edited by pughphonos on Tue Apr 29, 2014 3:18 pm, edited 3 times in total. "Christie's auction, 6 August 1998"
Sold: Christie's auction, South Kensington, London, UK, for $1033.00 US. No. BN22929, with bronze finish Edisonic reproducer, in console cabinet with crossbanded and figured mahogany doors, upper and lower record compartments and divided lid. Last edited by pughphonos on Fri Apr 25, 2014 9:58 pm, edited 2 times in total. 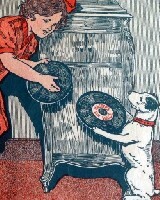 "I have an Edison Disc Phonograph passed down from my great grandmother that I rescued from my dad’s barn. I have a family now and would like to leave something special as an heirloom, I have very little except my dad’s 54’ Chevy and the fishing pole that my grandfather had giving me. I remember seeing it in my grandmothers living room and playing with it as a little kid. It is in terrible condition, having been passed around by family after my great grandmother passed away and eventually being left out side in a barn and forgotten by everyone except me. I picked it up a few days ago and it is in my house now but in terrible condition. It is a cabinet piece but the two front doors are missing, my dad took them off to 'restore them' and then lost them years ago, and everything is in just bad shape, I think the spring is stuck, hopefully not busted, because the handle will not turn any more. I would like to identify it so I see what the doors were suppose to look like, I believe they were solid, and also so I can have some better reference to go by when I start working on it. I have tried searching the net but could not find a style or model to match it. Any help would be greatly appreciated. On the name plate it is engraved BN 2157 (serial number ? ) above the turn table it says in golden color The Edisonic, and on the factory label it is No. 18 but I can not read the factory name because it is too worn. Any help would be greatly appreciated. Thank you." In subsequent posts to the same site, James78 posted the photographs below. Last edited by pughphonos on Wed Apr 30, 2014 12:41 am, edited 6 times in total. "Designers Consignment" offered a Schubert Edisonic for $599.99, providing photos and the vague description "record turn but needle does not hit." This sale is dragging as the same E-bay posting is still up as of May 14, 2014. NOTE: The posting above is confusing. It is selling as #3695, but that must be some sort of store lot number as one of the photos is of the ID tag and it clearly shows serial number 5056. NOTE: A previous owner was Michael Malloy, who posted about this machine on the Online Edison Phonograph Discussion Board on July 17, 2012: "Hello, I just joined the forum. I have what I am 95% sure is a Edisonic Schubert with a serial # of CLT 5056. It was repaired at some point very poorly. I was wondering if any one could send me a photo of what the lid support arm apparatus should look like. I'm trying to repair it currently. Last edited by pughphonos on Wed May 14, 2014 2:48 pm, edited 7 times in total. Nice original condition with replaced front knobs. I think the originals were made of wood. The grillcloth has the characteristic narrow "fade line" from top to bottom where direct sunlight must have been able to get through regularly. I've seen others like this! Last edited by barnettrp21122 on Fri May 02, 2014 10:52 pm, edited 1 time in total.